Welcome to the latest instalment of Brian’s Travel Spot. Regular readers will know that I have something of a love affair with travelling by train, particularly sleeper trains, be it on trans-America trips, hopping between Beijing and Shanghai on China’s high-speed rail network, or taking the slow train in places like Vietnam or Thailand. However, my love affair with the sleeper train actually began in the UK with the Caledonian Sleeper, which runs between London Euston and variety of Scottish destinations. Two weeks ago, I travelled up to Glasgow for the Glasgow Coffee Festival, a trip, which, for a variety of reasons, required me to leave on the Thursday evening before the festival and be back home by the Monday afterwards. In theory I could have done the trip on the regular train, but instead I turned to the Caledonian Sleeper, a far more romantic way to travel and, as it turned out, far more practical and just as cost effective. So how does the UK’s premier sleeper service stack up against its American and South East Asian counterparts? Read on as I take the Caledonian Sleeper to Glasgow and back! My original plan for the Glasgow Coffee Festival was to go up for a week, splitting my time between Glasgow and Edinburgh, while also taking in the festival. Unfortunately, ever since this year’s London Coffee Festival, I’ve been suffering from a reoccurrence of an old back problem. This rather put paid to my grand plans since I needed to be in Guildford for appointments with my chiropractor on the Thursday before the festival as well as the Monday afterwards. In theory I could have done the trip on the regular train, but one of the symptoms of my bad back is that I can’t sit down and the thought of standing for 5½ hours on a Pendolino as it swayed its way up the West Coast Main Line was too much to bear. Instead I turned to the Caledonian Sleeper, with its promise of being able to spend the entire journey horizontal. I travelled up on Thursday night, straight after my chiropractor appointment, leaving me Friday free to explore the growing speciality coffee scene on Glasgow’s south side, including Short Long Black, It All Started Here and The Good Coffee Cartel, before returning on the Sunday night after the festival, arriving back in London on Monday morning. If truth be told, I was actually quite pleased. 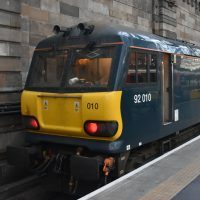 I love travelling on the Caledonian Sleeper, having made several overnight trips to/from Scotland over the last decade or so, including when I went to the 2015 Glasgow Coffee Festival, so I jumped (metaphorically, literally jumping with my back in its current state is a bad idea) at the chance to take the sleeper again. As it turned out, it also proved to be a pretty economical decision. I’d left the decision to travel fairly late in the vain hope my back would get better, so all the advance fares had gone. If I had gone up on the regular day-time service, it would have set me back £150. Instead, I paid £180 for the sleeper (£100 for the leg to Glasgow, £80 for the return) plus £26 to get to and from London from Guildford. On the face of it, that’s £55 more for the sleeper, but that includes two night’s accommodation. Once you factor that into the equation, it would actually have cost me more to travel by day. I set off straight after my chiropractor’s appointment and was up in London by 19:30, which gave me time to catch up with some friends before reaching London Euston at 21:00. I make no secret of the fact that Euston is not my favourite London station. In fact, it’s in a battle for bottom spot with Victoria. Unlike its near-neighbours, St Pancras and King’s Cross, Euston is a soulless 1960s concrete blot on the landscape. Although there’s been considerable effort to improve the station, including a semi-decent outdoor food court in front of the station and a mezzanine level inside, it’s still a miserable place to wait for a train, with inadequate seating and a layout that means that streams of passengers constantly cross each other (although it’s not alone in that respect). There is a passenger lounge, but that’s strictly for first class passengers only, although I’m sure that there was a time when travellers on the Caledonian Sleeper, regardless of class, could also use the lounge. Maybe my memory is playing tricks on me, but those days, if they ever existed, are long gone. As it was, my train was scheduled to leave at 23:53, so I had plenty of time to kill, although, as it turns out, you can board the train from about 22:00 onwards. One of the few advantages of catching a train that late is that the station was almost empty, so there were a few untaken seats dotted around. However, since I couldn’t sit down, that was rather cold comfort for me, so I used to the end of a banister at the bottom of a staircase as an impromptu laptop stand and wrote some of this post while I waited for the train to be announced. You can read more about Euston after the gallery. Having been rather critical of Euston, let me say that it does have some positive aspects. The main issue is that it’s a terrible station if you have to wait for a train and it rapidly turns into a nightmare if there is any sort of delay, with the concourse thronged with people, all getting in each other’s way, all trying to work out when their trains are going. The other thing about Euston is that it’s (relatively) easy to get to. Multiple tube lines run either to or close to the station, including the Northern Line, which connects it to Waterloo, my gateway from Guildford. In that respect, it’s actually my favourite departure point from London. It’s also well served by numerous bus routes. I wouldn’t, however, recommend driving there. My train was called at just after 22:00, so I made my way to Platform 1, which is on the far right-hand end of the station. Compared to Victoria, for example, the layout at Euston is pretty simple. Set back from the busy Euston Road, there’s the bus station out front, followed by the food court, with three entrances (left, centre and right) from there onto the main concourse. The main tube lines (Northern and Victoria) also disgorge their passengers through an entrance at the front of the concourse. Finally, there’s a sneaky pedestrian entrance on the left (western) side which leads straight to Platforms 16-18. The one thing it lacks is any entrance to the north, so if you’re walking from Camden Town, say, you have to go the full length of the station to get in. From the main concourse, the platforms are laid out ahead of you, 18 in all, with Platform 1 (where the Caledonian Sleeper departed from) on the right and Platform 18 (where my trains to Chester/North Wales often depart from) on the left. The usual problem with Euston is that when a platform is announced for a train, there’s a sudden flood of people, who are all waiting on the concourse, all breaking at once and heading for the platform. This inevitably leads to plenty of pushing as they squeeze past everyone else waiting on the concourse, while there’s usually another stream of passengers who’ve just come off a recent arrival going in the opposite direction. Just to make things worse, some genius decided that the best place for the fast food kiosks is at the back of the concourse, between the ramps leading down to the platforms, so the people queuing up for their food also get in the way. In defence of Euston, it’s not alone in this layout, with Waterloo, the other London station I regularly frequent, having identical problems. I can see why the new high-speed train stations such as St Pancras (and Waterloo International before it) have separate arrival and departure areas, which keep the streams of passengers separate, although I think that’s more to do with passport control issues than anything else! Of course, none of this was an issue at 22:00, so getting down to Platform 1 was the easiest I’ve ever had it. In days gone by, you’d be greeted by your steward at the door to your carriage, who would check your ticket, but these days, there are two “check-in” stations at the entrance to the platform, one for the Glasgow portion of the train and the other for the Edinburgh part. Once that’s been safely negotiated, just make your way down the platform and get onboard. You can see what I made of the train after the gallery. The Caledonian Sleeper is one of the longest passenger trains in the UK (as far as I know, only the Eurostar is longer), occupying pretty much the entire length of Platform 1 at Euston. There are actually two services, this one, the Lowland Sleeper, leaving at 23:53, and destined for Glasgow and Edinburgh, and an earlier service, the Highland Sleeper, which departs at 21:15. This goes to Aberdeen, Inverness and Fort William, splitting in three at Edinburgh. While I’m sure that in the past you could book a sleeper on this train to Edinburgh, these days if you want to go to Edinburgh, you have to catch the later train. The Lowland Sleeper splits in two at Carstairs, the front going to Glasgow and the rear to Edinburgh. Each section has a similar configuration, the rear-most coach fitted out with a small number of what look to be large, comfortable seats, so if you can face sleeping sitting up, these offer a cheap alternative (about half the price of the a berth in a sleeper). Next comes the saloon car, and then there’s a series of sleeper cars. The Edinburgh portion has five (I think), then comes the seating coach and saloon car for the Glasgow portion, plus a further six sleeper cars. Finally, the locomotive is right at the front. Don’t be put off by the locomotive at the front of the platform, by the way. At Euston, this is 87002 (for those who are interested), the sole remaining Class 87 locomotive in the UK. This 45 year-old engine once hauled flagship express services on the West Coast Main Line, but is now relegated to shunting the empty cars in and out of Euston each day. A rather sad end if you ask me. Each sleeper car either has 12 or 13 cabins, each with two bunks per and a pair of toilets at one end. There’s a door at each end of the carriage, with the cabins accessed by a narrow corridor which runs down on side of the carriage. Heavy, wooden doors separate the cabins from the corridor, so there’s no danger of anyone wandering past and looking in on you. As far as I could tell, there’s no separate first class sleeper car: if you book first class, you just get a cabin to yourself. Meanwhile, if you book standard class and are travelling alone, you are likely to end up sharing with someone of the same gender, although there’s no concept of male-only or female-only carriages. The heavy wooden door opens inwards, so be careful in case there’s someone else inside. There’s a long, narrow space on the same side as the door, with two fixed bunks on the other side, although I think that the top bunk can lift up if you’re the only person in the cabin, not that it makes much difference. At the far end, opposite the door, is a small window, with a wash basin underneath it. There’s not a lot of luggage space, just a shelf running the width of the carriage above the window or you can use the floor under the lower bunk. There are some hangers on the wall by the door, where you’ll also find a connecting door to the next cabin, so if you are travelling as a family, for example, you can book both cabins and treat them as a single room. Unlike many other sleeper services I’ve been on, these are not designed for sitting in since they only really run at night. That said, you can perch on the bottom bunk unless you’re really tall, although there’s not much of a view out of the small window. You can see how the journey went after the gallery. My first stop, after stowing my bags in my cabin, was the saloon car. Technically this is reserved for first class passengers, but common folk like me, travelling in standard class, are tolerated (in all fairness, the staff were very welcoming, although first class passengers have priority when it comes to seating). Even if you’re not planning on stopping for any length of time, you really should visit the saloon car, since it’s a flashback to a bygone age. Where else would you find sofas and armchairs on a train? There are two three-seat sofas on the left and right, followed by three tables on either side, each with two or three armchairs, but that’s it for seating. Each table has a menu, while there’s a bar halfway down the carriage, with the kitchen behind that. The saloon car serves light meals, snacks and drinks, including tea, coffee and a very wide range of Scots Whiskey. It was too late for me to eat, but someone had ordered a late dinner and the smell coming from the kitchen was very enticing. Instead I ordered some port, which was surprisingly passable, and took it back to my cabin. If you’re looking for somewhere to sit and work with your laptop, it’s worth knowing that the saloon car is the only part of the train with any power outlets (although each sleeper cabin has four USB outlets, inconveniently placed high up above the sink, where you can charge your phone, as long as you have a long enough cable). Unsurprisingly, modern innovations such as Wifi are not to be found. The beds are already made up when you board the train, with good, thick mattress and a pair of pillows. Everyone also gets a magazine, towel, and sleep kit (ear plugs, sleep mask, etc). You can order (and pay for) breakfast (although it’s free if you’re in first class) using a menu that’s on your bed. Simply fill out what you want and hang it on your door. Since the train arrives in Glasgow at 07:20 and breakfast is served 45 minutes before arrival, I passed on this, reasoning that I’d prefer to have a lie in and get breakfast somewhere near the station (if you’re interested, I’d recommend Riverhill Coffee Bar, although there are plenty of other options fairly nearby). I’d managed to end up in the upper bunk (although I don’t remember being allowed to specify when I booked) but my cabin-mate offered to swap when he heard about my bad back, which I was really grateful for since I wasn’t sure I would be able to make it up and down the removable ladder. I’d describe the cabin itself as very cosy: I wouldn’t like to try to do much else than sleeping in there when there are two people in the room. Fortunately, my cabin-mate went to the saloon after swapping bunks and dropping his bag off, so I took the opportunity to get changed, more for space than modesty, and so that I’d be out of the way when he got back. I was also able to use my laptop for a while, standing up and resting it on the top bunk. Another option, if you’re not too tall, is to sit on the lower bunk with your legs over edge, laptop on your lap (where it should be, given its name). Although I couldn’t sit down, I tried it for size and could just about manage it, although I was hunched up and it really wouldn’t work unless the other person was out or lying on the other bunk. The final option is to use your laptop lying down on your bed since there’s good headroom, while the bunk is (just) long enough for me, at 6’2”, to lie flat. The doors are closed at 23:45 (bear in mind that these are old-style slam doors, nothing automatic here) in readiness for departure and we left on time at 23:53. I went to bed shortly after that, which meant that I had about seven hours in bed, although the seasoned hands at this taken advantage of early boarding to get their heads down straight away and are asleep long before the train leaves. The bed itself was comfortable and the ride surprisingly smooth and quiet (one advantage of having an electric locomotive). There’s a large fold-down shelf which is good for storing glasses, etc, although you can knock it if you roll over in the night. The ear-plugs, by the way, are to be recommended since there’s not much in the way of sound-proofing. For example, I could hear the people in the adjacent cabin talking. I slept pretty well, and while I woke up once in the night, that was more to do with my bad back than the train. I remember taking the train on previous occasions and sleeping a lot worse, with the train stopping at multiple points along the way to pick up and drop off passengers. In contrast, the service now only stops at Carlisle, Carstairs (where it splits) and, if you’re going to Glasgow, Motherwell, which contributed to my good night’s sleep (for example, I didn’t even notice the stop and separation at Carstairs). We arrived on time at Glasgow, my cabin-mate getting up and vacating the cabin before we arrived, which meant that I had the pace to myself when I got up. I took my time and wandered off the train at 07:20, greeted by the glory that is Glasgow Central Station. You can see how I got on during my return journey after the gallery. One thing I did notice, arriving not long after 7 o’clock in the morning, is that this is before some of my favourite Glasgow Coffee Spots were open… Being awake before the coffee is is never a good idea! That minor difficulty aside, I had a good time in Glasgow and before long, Sunday evening rolled around and it was time to head back to London. Normally, the Caledonian Sleeper leaves Glasgow Central at 23:40, arriving back at London Euston at 07:07. However, on some Sunday nights, the West Coast Main Line is closed for engineering works, and the train is diverted along the East Coast Main Line. When this happens, it leaves early and my return was one of those occasions, the train scheduled to depart at 21:44, a whole two hours earlier than normal. Even with the earlier departure time, I still had plenty of time to kill since the Glasgow Coffee Festival finished at 18:00. Normally I’d just retire to a restaurant, but the whole not being able to sit down thing rather counted against that, so instead I headed for Champagne Central, a bar inside the Central Hotel that overlooks the main concourse of Glasgow Central Station. One of the first places I wrote about when I started the Coffee Spot, I wouldn’t necessarily recommend the coffee these days. However, it still makes a marvellous place to wait for your train, plus it has a window-bar overlooking the concourse, where I could stand (very important) and watch for my train. Having been rather rude about London Euston, I have to say that arriving in Glasgow Central rather proves my point. This is a Victorian masterpiece, a glorious piece of engineering and a fitting entry point to Scotland’s biggest city. The train line runs over the Clyde, continuing for a short way above the streets of Glasgow, the extended platforms standing high above the surrounding streets. The concourse ends in a magnificent hotel, the Central Hotel, which is still in operation, and is every bit the equal of its equivalents at London St Pancras or Charing Cross. The main concourse has a something in common with Euston, in that they are both large, open spaces without enough seating, but that’s pretty much it. Whereas Euston has a rather plain, concrete roof, Glasgow Central has a magnificent, soaring glass roof giving it a sense of immense space. Like Euston, the station concourse is at the front, with the platforms at the back. It also has multiple entrances, including one under the station on the south side, handing if you’re approaching from the river. The station has grown organically over the years, starting with the six main platforms at the far end of the concourse. Additional platforms have been added to the right of these, their entrances set a little further back, which can make finding your platform a little tricky. There’s also a set of low-level platforms, where an east-west line runs under the station. Add to that the Glasgow Subway and it really helps to know where you’re going! Although the train was due to leave at 21:44, it only arrived on the platform at 21:15. However, I suspect that in normal operation, it would probably turn up about this time, allowing passengers a leisurely couple of hours to board the train. As it was, there wasn’t that much time, so I just hopped on and headed straight for my cabin, which partly explains the lack of photos. Unlike the trip up, there were no ticket checks on the platform, our steward greeting us at the door to the carriage. There was also an offer of free tea, coffee, apple or orange juice, plus biscuits, for breakfast at Euston. This time, I was in a lower bunk and, as on the way up, my cabin-mate (different random person this time) headed off to the saloon car, leaving the place to myself. By now, I was knackered, having spent the last three days on my feet, so I went straight to bed. I dozed for a while, then dropped off, sleeping right through the journey. I didn’t notice my cabin-mate coming back, nor did I notice us joining up with the Edinburgh portion of the train. The next thing I knew, it was 06:45 and the steward was knocking on our door with our breakfast. My cabin-mate was up and out by 07:00 and our arrival into Euston was so smooth that I didn’t even notice that we’d arrived. As it was, I took my time and left around 07:20, making a beeline to Beany Green for some decent coffee! So there it is, my Caledonian Sleeper adventure. It’s such a lovely way to travel and one I’d heartily recommend, definitely beating flying, although I still have a soft spot for the East Coast Main Line out of King’s Cross to Edinburgh. However, if I’m going straight to Glasgow, taking the sleeper definitely beats going on the West Coast Main Line. If you’re interested, the Lowland Sleeper is due to have new rolling stock in October 2018, so if you want to experience the old rolling stock, you’ve only got a few months left. That said, the old rolling stock will still be on the Highland Sleeper for a while yet. Hopefully I’ll be able to try out the new service later this year and see how it compares. This entry was posted in Brian's Travel Spot, Glasgow, Inner London by Brian Williams. Bookmark the permalink.